Here’s our Vancouver Fishing Report for January 2018. We slacked a bit in December, too busy with the holidays but back at it now. So far we have’t a pretty good winter of fly fishing on our local rivers. With the exception of some cold days through December, Winter temperatures have been relatively mild, keeping rivers in good shape with some solid bull trout fishing to be had. We’ve been really busy with trips, which as has been great, and most trips have seen at least a few fish and more opportunities. Some bigger bull trout as well, mainly eating on egg and flesh patterns. Those are our go-to flies from December through February, mimicking the remnants of the Fall salmon migrations, the wintering trout feed heavily on this portion rich diet. 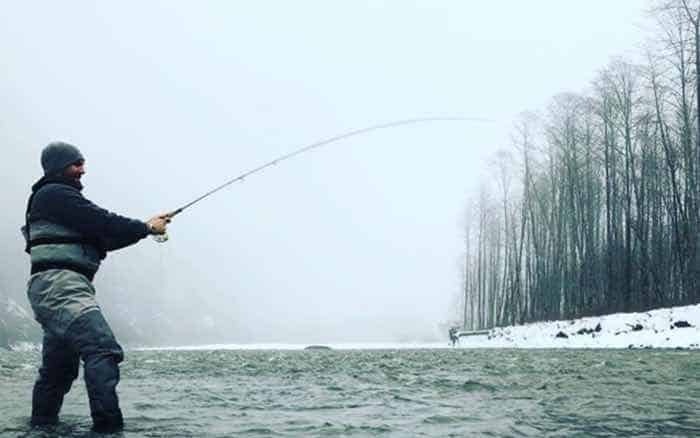 If you’d like to book a Vancouver fly fishing trip with us, we’re offering our Winter Special until February 20th, with 15% off day trips and 20% off packages. It’s been a surprisingly good winter so far on the salmon fishing front around Vancouver, with decent fishing for winter chinook salmon. 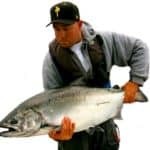 Yup, we offer charters year round from Vancouver, even during the winter months and in January we usually have some solid fishing for the chinook (king) salmon that congregate in the area, feed on bait. Our recent trips have all done well, all catching fish, which is always nice, especially when folks brave the cold and the rain. In the winter months we also try to drop some prawn and crab traps if conditions permit, and they have so far, a little added bonus to a day’s fishing with us. If you’d like to book a Vancouver salmon fishing charter with us, we have open availability throughout January and February. Been doing the very odd sturgeon trip on the Fraser River this winter, but conditions have been cold, with some less than desirable days to be on the Fraser River. The trips that have been out have all caught fish and this time of year is beautiful on the river, very few people and enormous stretches of water all to ourselves. If you’re thinks of a Fraser River sturgeon trip, we might suggest you wait until later February, even into March and April, that’s when things will pick up for us and when we’ll see some better fishing and certainly some better weather conditions. If you’d like to book a Fraser River sturgeon trip with us, we have open availability throughout January and February but area already getting booked up for later dates in the Spring and Sumer.